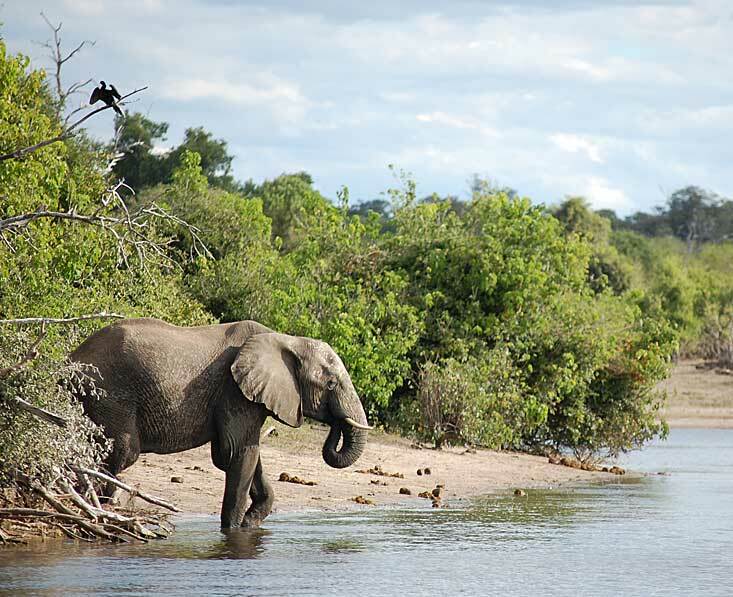 Covering 11,000km2, Chobe National Park is one of Botswana’s largest reserves. It is strongly connected with elephants. 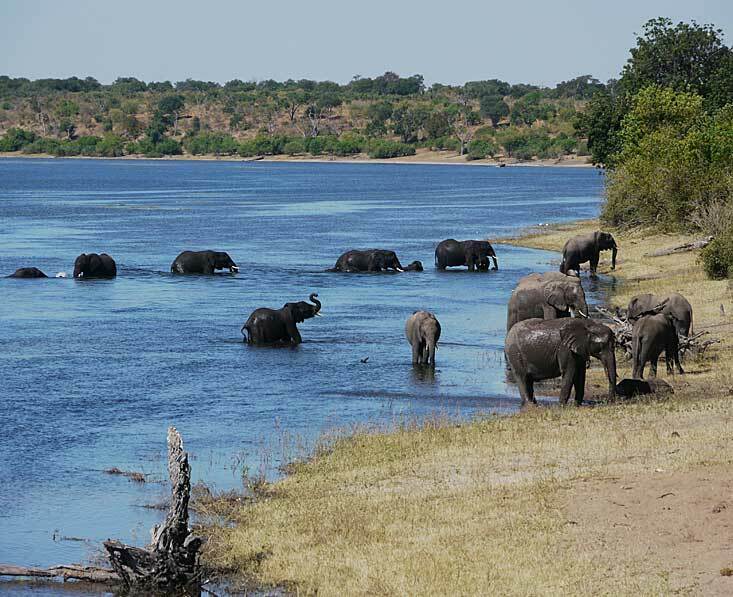 There are literally thousands of them (possibly 70,000), particularly in the dry season of May to October, drawn here by the wide Chobe River which forms the northern border of the park. The Savuti is an area within Chobe but very different from the riverfront area. 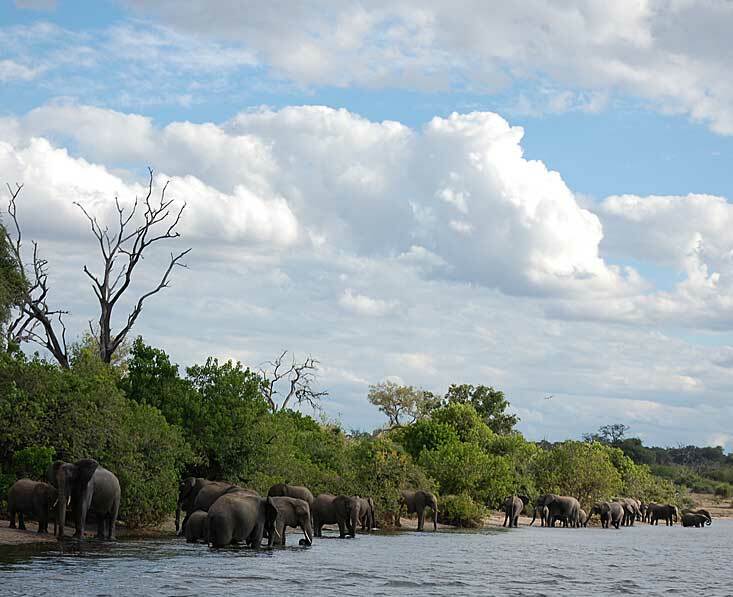 Chobe Riverfront & forest reserves: The riverfront is the best area in Chobe for wildlife due to the life-bringing waters of the permanent Chobe River. Whilst there is game here all year round, the very best months are in the dry season from about May to October. 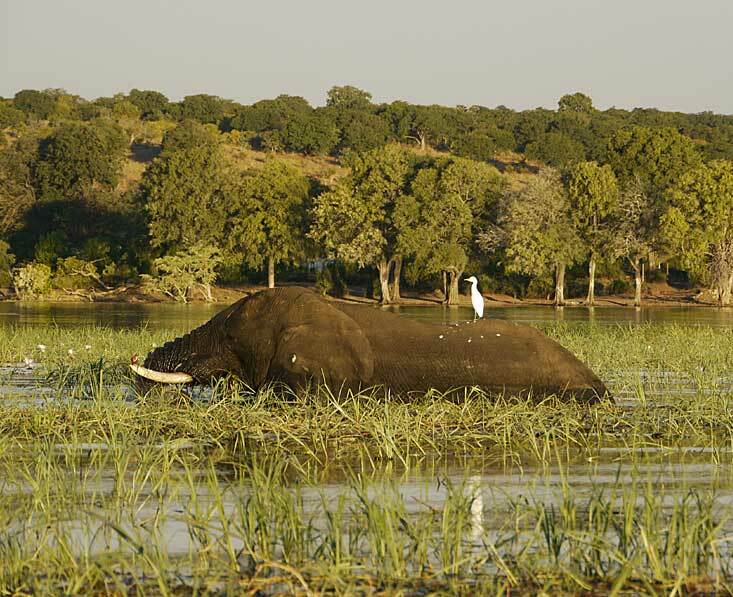 At this time elephants frolic in the river, there are good numbers of buffalos and sable antelope, predators such as lions are never far away, and there is a diverse range of other general wildlife such as hippo, giraffe, zebra, jackal, warthog, and kudu. In about November/December many animals give birth, and as the rainy season gets going the wildlife disperses more widely throughout the park. Birdlife is especially good in the rainy season and wild flowers flourish. Chobe Riverfront is a popular place to visit, and since the nearby town of Kasane has lots of hotels and lodges, it is always quite a busy area. There is only one lodge within the park itself (Chobe Game Lodge), though the mobile camp, Chobe Under Canvas, is often set up within the park too. 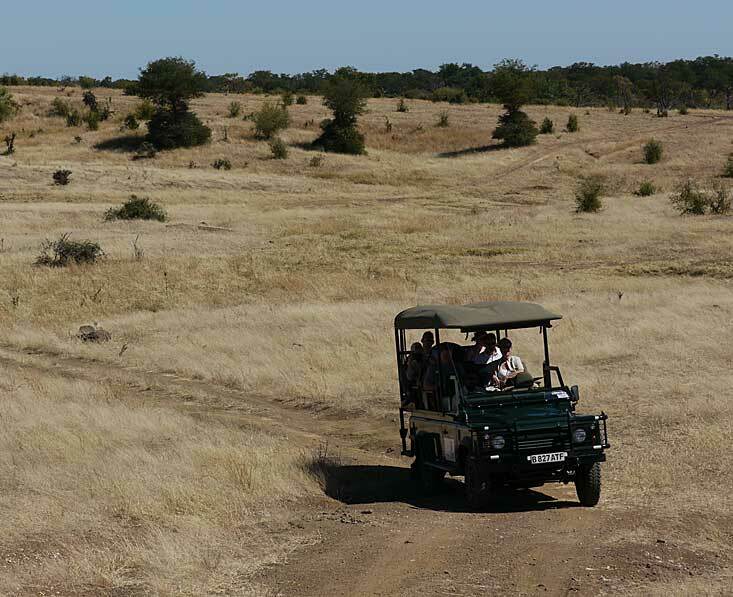 Activities at the riverfront include game drives and boat safaris. Being a national park, no walking, off-road driving or night drives are allowed. The Chobe Forest area is just north west of the park and here you will find three lodges (Ngoma Safari Lodge, Muchenje Safari Lodge and Chobe Elephant Camp). This area is not governed by national park rules so the first two of these lodges offer night drives and game walks. This is a much quieter region that the eastern riverfront near Kasane. Animals are free to roam from the national park to the forest reserves, and whilst the wildlife density is much greater by the river and further east, this western area has the benefit of offering a more personal experience and beautiful views down over the floodplains. 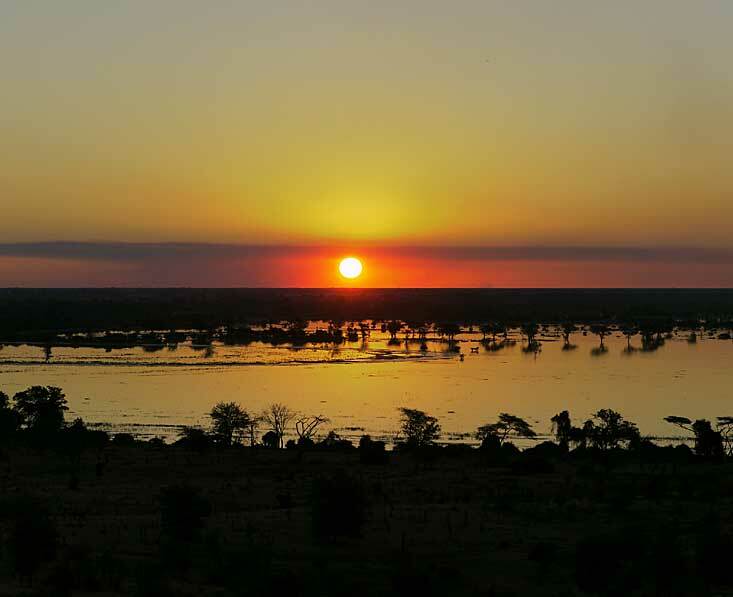 Savuti: The Savuti, a 5000km2 area of western Chobe, lies within the geographical feature of the Madabe Depression, which was once a vast lake. It includes the Savuti Marsh, Savuti Channel, Madabe Depression and the Magwikhwe sand ridge. In the dry season (May to October) this is mainly an inhospitably dry landscape, though since the Savuti Channel started flowing again in 2008 for the first time since 1982, there is relief for the wildlife and this is once again a good wildlife site in Botswana with even a very good number of bull elephants. No one knows why the channel began flowing again after almost 30 years, and it’s impossible to predict how long or how far the seasonal water will flow each year. 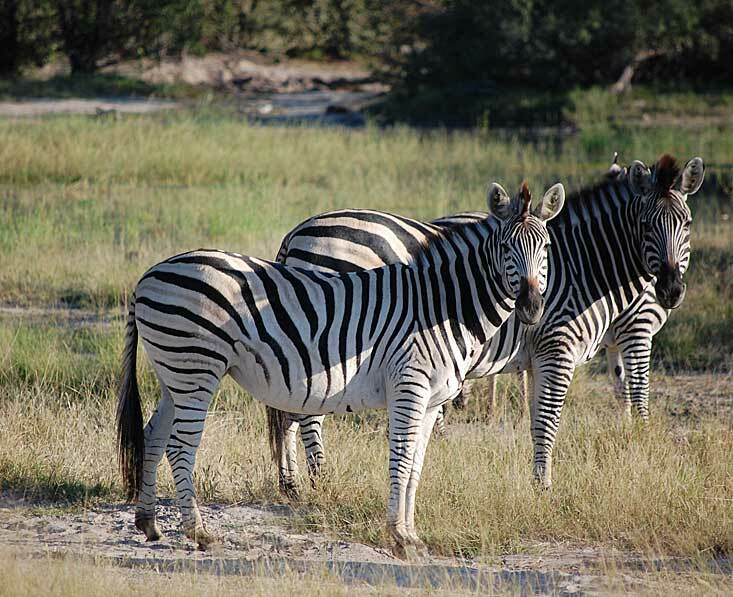 In the Savuti Marsh lush vegetation attracts an annual zebra and wildebeest migration in the rainy season, as well as superb birdlife, so the wet season months of November to May can be some of the best months to visit. The Marsh is excellent cheetah and hyena country and even wild dogs have been found here in the wet season. One of the lion prides here has become so large that they take on elephants if other wildlife proves too tricky. The other trick they’ve learned here is to fish catfish out of drying waterholes! Leopards are increasingly being seen quite regularly here too, so all in all the Savuti Marsh is a good predator area now. Two features of the Savuti are the sand ridge of the Ghoha Hills, and the dead (drowned) trees of the Savuti Marsh which make for eye-catching photographic images. Another little-known fact about the Savuti Marsh is that San Bushman paintings can be found on the Gubatsa Hills. There are only 2 lodges in the Savuti Marsh (Savuti Safari Lodge and Savuti Elephant Lodge), and another (Ghoha Hills) can make a day trip here.